Hortus Camdenensis | Euphorbia milii Des Moul cv. splendens (Bojer ex Hook.) Ursch & Leandri. Euphorbia milii Des Moul cv. splendens (Bojer ex Hook.) Ursch & Leandri. Frost tender, semi-prostrate to scrambling, slow-growing, mainly evergreen, semi-succulent shrub with slender, fleshy, thorny stems and branches and axillary cymes of intense red flower-like bracts and reduced floral parts in spring and summer. To 30cm, spreading to several metres. 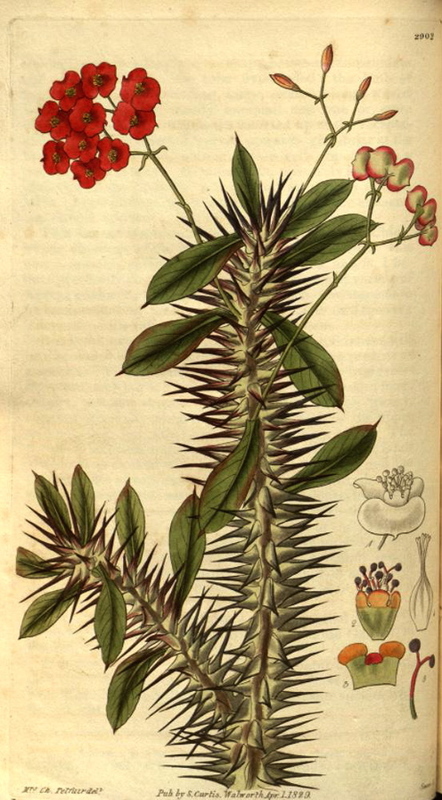 The type Euphorbia milii is a bushy shrub, to 1m or more. [RHSE, Hortus]. ‘This handsome species of Euphorbia, well deserving the name of splendens, given to it by its discoverer, we trust will ere long, through the medium of our Botanical friends in the Mauritius, be introduced to the stoves of our country.’ In a footnote the author commented: ‘I have recently seen the plant blossoming in the garden of the Horticultural Society of London, in great perfection.’ [BM t.2902/1829]. Splendens was actually introduced to Britain in 1826 and first flowered at the Horticultural Society gardens. [JD]. ‘It appears to be a dwarf plant. Our specimens, none of which were a foot in height, flowered in the months of March and April, lasting a long time in beauty. Their colour is unusually rich.’ [LBC no.1713/1833]. Listed in the 1850 and 1857 catalogues [T.442/1850]. More details about Euphorbia milii Des Moul cv. splendens (Bojer ex Hook.) Ursch & Leandri. Euphorbia splendens Bojer ex Hook.